The waistband is one of four essential parts of a cloth diaper and is the first up in our Components of Cloth series. There are a few pieces we will talk about today and the options you have to choose from. It’s my hope that by showing you how each section of a cloth diaper works, you can better determine which features you need to suit your individual requirements. Some people start cloth later, some have chunky babies, some skinny babies, some are tummy sleepers, etc. The things that make your child unique are endless, so you want to try to determine which features to look for in a cloth diaper. Maybe your baby isn’t even born yet and you are still diving into research for research sake! This series is discussing popular designs for One Size diapers. Newborn cloth has its own unique set of attributes and we don’t want to clutter this particular blog series with that for now. Stay tuned for a Newborn series later on. 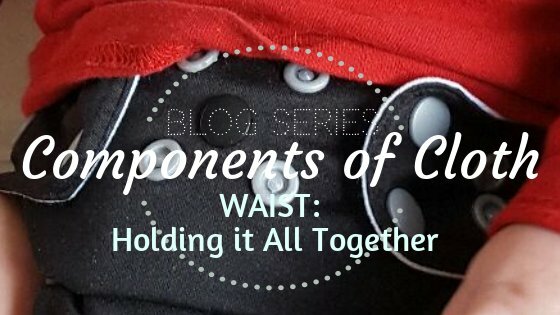 The front piece of your waist band is for holding the tabs down. It has either a Velcro landing strip or female snaps. These allow you to adjust both the waist (upper row) and thighs (lower row) independently as needed. If you have a chubby waisted baby you can leave the top row looser, and vice versa for chubby thighs. Having two rows is trickier for toddlers to open, which is a good thing. Snaps can also be a problem for parents or caregivers with arthritis or dexterity issues and so you should keep that in mind. Velcro tabs fasten to this strip- it’s the soft part of the velcro, and its width and height varies by brand. This option is easier for toddlers to open so many use it for the newborn/infant stage. It’s also easier for parents and makes a great option for late night diaper changes (even Toddlers can be tripped up by pajamas over velcro) when you are too tired to fumble with snaps. Because the strip is not spaced in any way, Velcro allows for a very accurate and custom fit. It is higher maintenance than snaps, though, and extra care must be taken when washing and machine drying. This allows you to adjust the width of the waist only, and fit is limited by the number of snaps given and their set spacing. Snaps are harder for toddlers to open on their own, but can be harder for parents too if you have arthritis or dexterity issues. The front of your waist band may or may not have tummy elastics, depending on brand. These can prevent tummy leaks and gaping. 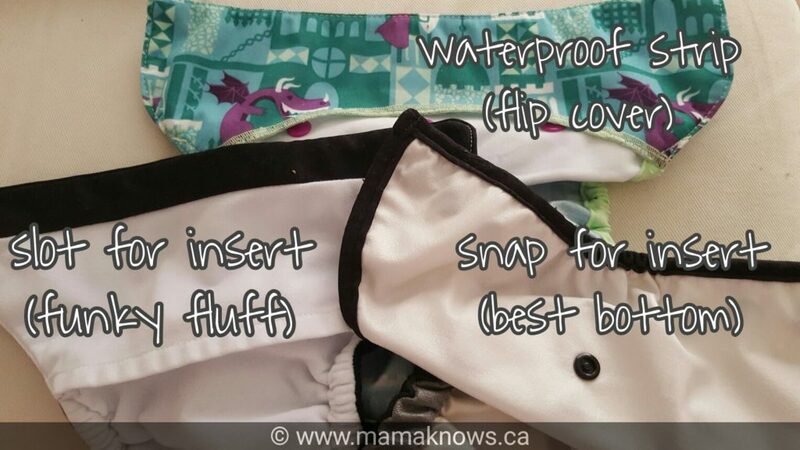 If the diaper has this feature, it is along the very top of the front waistband above the snap or velcro. The image above showing a Thirsties cover labeled “Single row snaps” has a tummy elastic visible. I find this feature handy at the toddler stage because it keeps the waistband from gaping outwards while they’re running around. 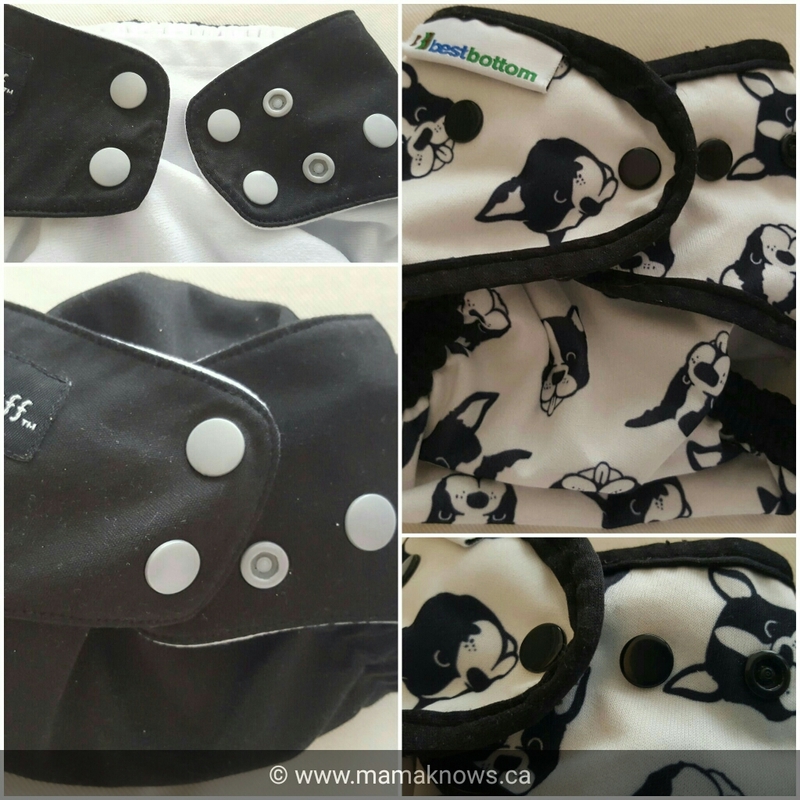 Best Bottoms and Thirsties Covers both have the tummy elastics. Typically Pockets and All In Ones do not have this feautre, but AMP and Applecheeks do. The inside of the front waistband has a few different options or features as well. Ideal for tummy sleepers and for boys, who typically wet to the front and upwards. Snap to hold insert: For all in two systems like Best Bottoms and Grovia Hybrid Shells, you’ll see a snap casing on the inside front of your waistband so you can simply snap your insert into place. The back of your diaper also has a few options that do affect its performance and use. Just like the front elastic, this option is available on the back as well. It is useful for preventing blow outs of poop up their backside. Especially useful at the sitting stage, or when in an exersaucer or baby carrier where the front is compressed and poop is forced to the back area of least resistance. If there is a snap on the front, there is more-often than not a snap on the back as well. This is for attaching inserts to the shell. Again, if there is a slot at the front there is likely one at the back too. The Blueberry Capri is a good example of this. Velcro or Snap, your waistband has tabs to close the diaper and these tabs come in a variety of styles and shapes. Waistbands with two rows of snaps will have two snaps on the tabs, and conversely with a single row on the waistband comes single row on the tabs. Typically the material used on the tabs is the same as the rest of the diaper. bumGenius diapers are an exception, as they use a stretchy material on the tabs that allows for more flexibility. It should be said upfront that the ease of use for velcro comes with a price- and that price is increased maintenance. I destroyed the velcro tabs on my first two velcro diapers because I had no idea that they needed special attention. There are foldover “Laundry Tabs” that must be used in order for the velcro to have something safe to stick to in the wash. If you forget, you will end up with gunk-filled velcro that sticks to the rest of your diapers. High heat is not recommended with velcro tabs, so to keep them in their best condition you might consider air drying. I usually pull mine out of the load before I put everything in the dryer. If it’s a cover, it dries quickly anyways. By the toddler stage, Little had figured out how to remove them though, and we went All Snaps with him. So would I want an all velcro stash? Probably not, but I could definitely make it work. Would I give up the few velcro diapers I have? Nope. Despite the issues, these still have a well loved spot in my stash. I love them for my husband, and for late night changes when I’m half asleep. These are becoming the most common method to fasten your diapers. The snaps on your tabs will be Cam Snaps made of strudy plastic and come in many colours. If you are crafty, you can even change the snaps to different colours just for fun (do so with caution, as it probaby voids any warranties). There are a few options within the snap tab variety such as Hip Snaps and Crossover Snaps. 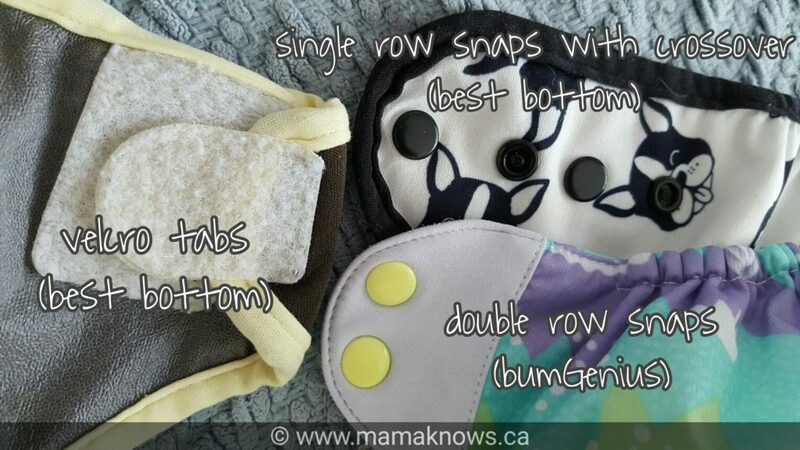 Hip snaps are an extra snap on the tab that can connect to the bottom row of a Two Row Snaps diaper. It allows for a better hold and also the ability to tighten the thighs more. Funky Fluff has these snaps, you can see them on the top left image in the graphic below. One hand feature on some diapers is the ability to crossover the snaps. This means the snap from one tab can fix to a matching snap on the other tab. You can now fit the waistband smaller for newborns, or you can roll the diaper up when dirty and snap it closed like a disposable. Whichever diaper features stick out most to you, and whatever brands you try- remember that it doesn’t have to be all or nothing. You can build a stash of diapers of different types and brands if you like. Or, you can find one you really love an run with it! Anything you don’t like, you can pass on via online Buy and Sell boards or donate it to your local Cloth Diaper charity. That way, another mom can love it!